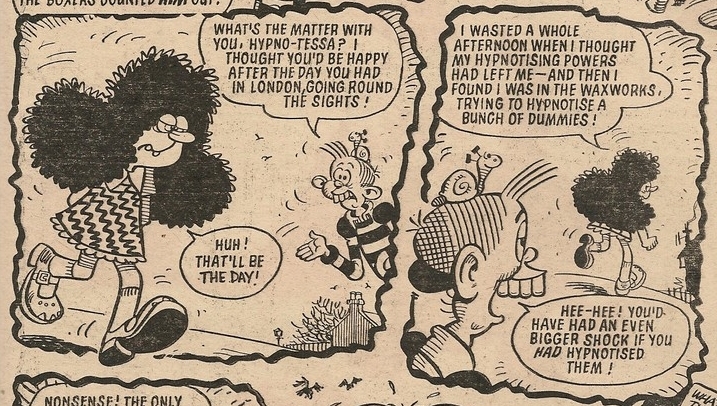 Mini mesmeriser Hypno-Tessa made her debut in Cheeky Weekly dated 14 April 1979. A sceptical toothy funster doubted her hypnotic skills, but was forced to concede when Teacher was observed in romantic pursuit of Ursula (hope his wife didn’t find out). 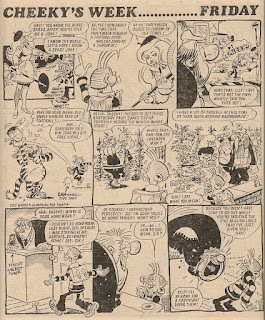 Most regularly seen in a migraine-inducing, zig-zag patterned dress (always drawn as such by Frank McDiarmid except for the 04 August 1979 comic in which Tessa appeared in singlet and shorts while competing in a cross country race), Tessa’s subjects were initially limited to Cheeky’s pals who, when entranced, exhibited actions contrary to their customary behaviour, but as the weeks progressed she began to direct her 'fluence toward late 70s celebrity (and in one case later notoriety). See table below for a list of all those who fell under Tessa's spell. 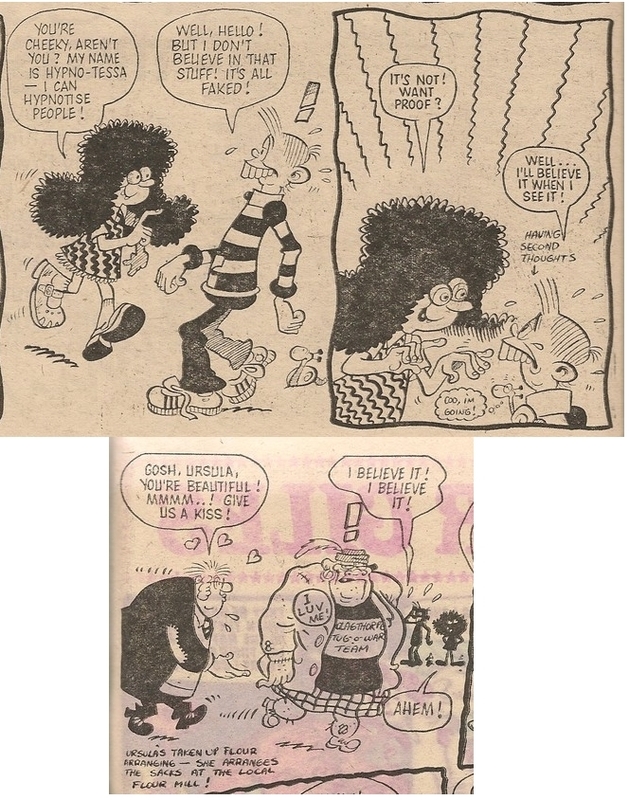 The third issue to feature Tessa, dated 05 May 1979, included two appearances by Cheeky’s new chum; one on Wednesday and another on Friday when Teacher was hypnotised into handing over his copy of Teachers’ Weekly to allow our grinning pal to read that week’s instalment of Menace of The Alpha Man. 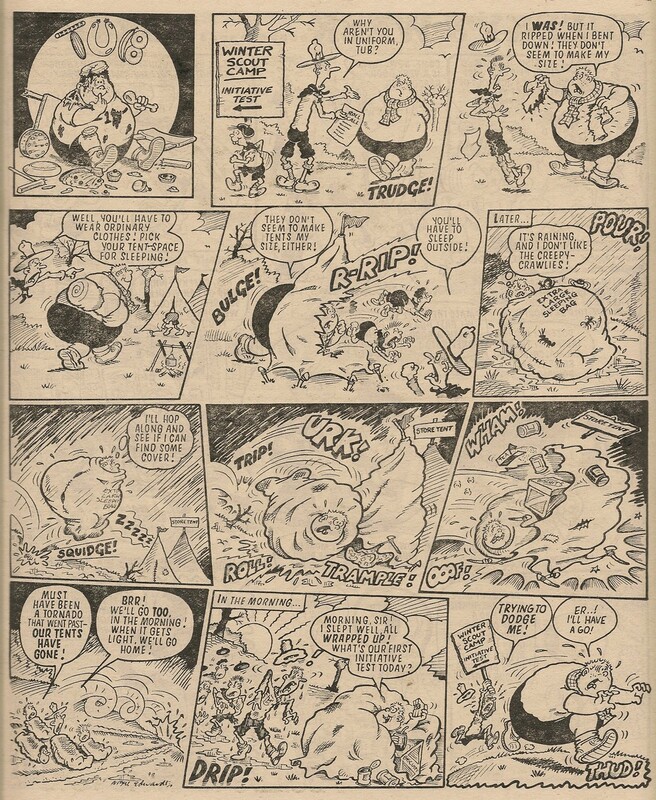 The 09 June 1979 issue was another highlight for fans of Tessa as she again appeared twice – first on Monday, and then as the subject of a full-colour Burpo Special. 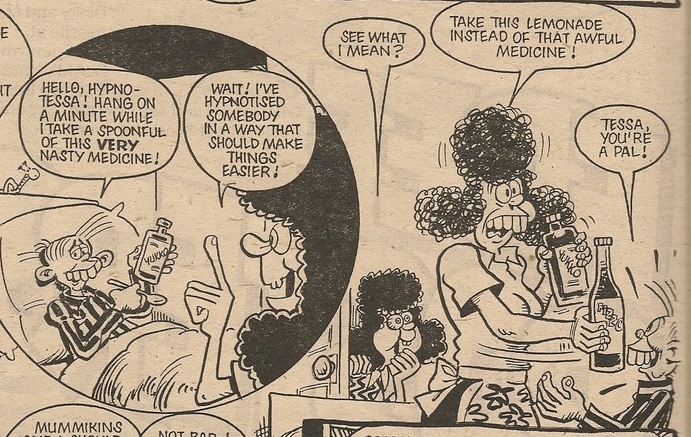 In the comic dated 08 September 1979, Tessa says ‘Just to prove I can hypnotise animals as well as humans, take a look at this’, indicating a confused-looking dog which she had induced into emitting a curious ‘Miaow!, Cheep!, Oink!, Mooooo!, Baaaaah!’. 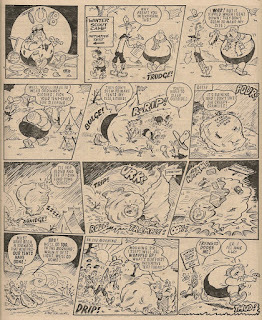 However, Cheeky and his readers had already witnessed a bull coming under Tessa’s spell in the 21 July 1979 edition, and a cat and dog were similarly entranced during the aforementioned Burpo Special in the comic dated 09 June 1979, although our grinning pal was not privy to those proceedings. The humorous hypnotist's final Cheeky Weekly appearance was a somewhat downbeat one, as she failed to exercise her powers of persuasion. Tessa never appeared in Cheeky's strips in Krazy, but featured in 28 issues of Cheeky Weekly. Just a week after suffering a raid by Toy Boy, Mustapha had his revenge. 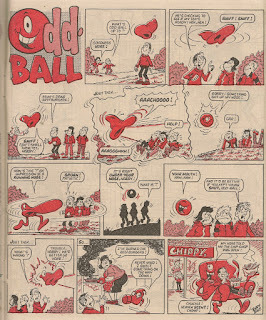 However, rather than a direct retaliation at the toy-loving tyke, our moneyed mate played a more subtle game and picked another strip from the fertile mind of Terry Bave, the stars of which didn’t smell a rat. This raid is not to be sneezed at - can you spot our ex-Cheeky Weekly chum? This is an unusual raid as Mustapha's probing digit seems to influence development of the plot - normally the interloper is seen but has no effect on the events unfolding in the strip. This week’s Cut-Out Comedy Catalogue gets a mention in the above-title banner – a bit of a cheek (pardon the pun) when the catalogue is just a cheap way of filling a couple of pages but IPC DO love a cut-out feature don’t they? Front cover fave Manhole Man is on hand to set up a Saturday Night Fever gag as our toothy pal embarks on his regular paper round. Disco Kid enjoys a boogie with fowl friend, while Snail gets a close-up. Over the page Frank McDiarmid gives us his Sunday, where Cheeky’s paper round continues and includes a delivery to Posh Claude’s mansion. On page 3 Calculator Kid is lacking the wherewithal to visit the flicks as “it’s the end of the week and my pocket money’s almost gone”, yet the previous page was Sunday so Charlie’s cash crisis must occur on either Sunday or Monday. Now I always believed that the first day of the week was Sunday, so was going to say that this story actually occurs early in the week, but it seems that Monday has officially been the first day of the week for some time, so clearly this Calculator Kid adventure occurs on Sunday and thus I withdraw my complaint. I was also considering raising an objection to the cinema being open on a Sunday, as in the late 1970s virtually all businesses in the UK would be closed on that day of the week, but it seems cinemas were given a dispensation to allow them to open their doors on what was known by some as 'The Lord's Day' as from the late 1950s. Following the cinema fun is reprint Soggy the Sea Monster, located surprisingly (to me, anyway) near the front of the comic. 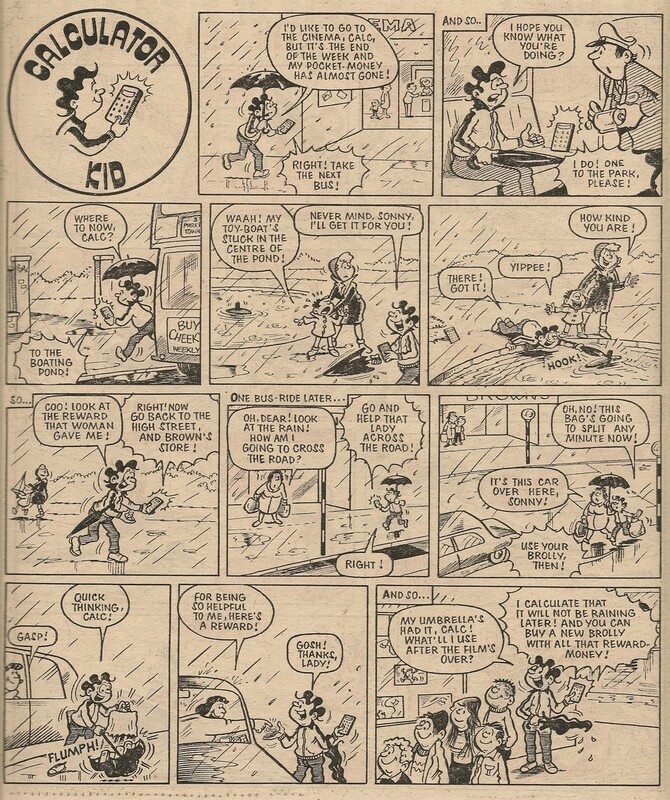 I have always assumed (possibly wrongly) that comic publishers place their most popular strips in the early part of the comic (aside from those that required a specific location such as the centre pages). 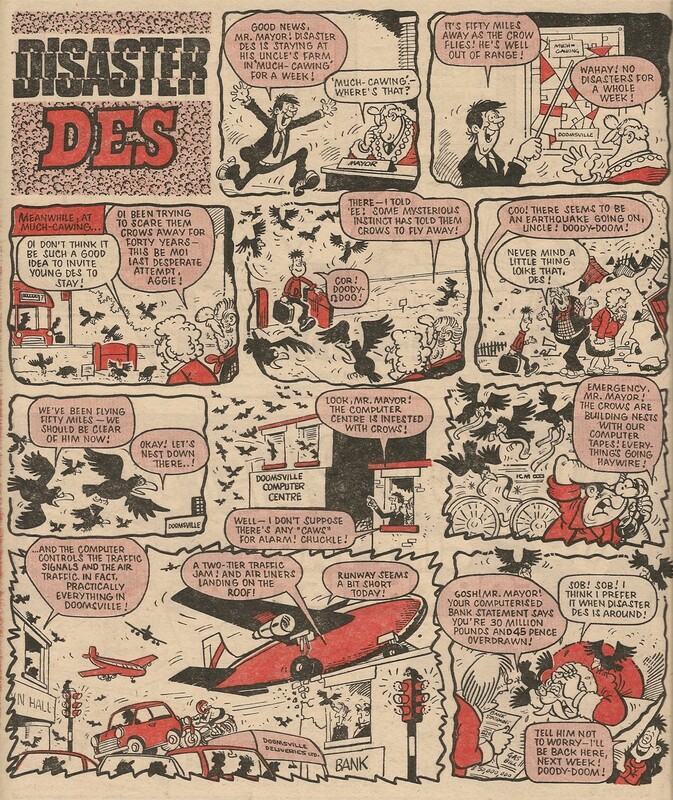 Maybe the Soggy reprints are proving popular - the banner above his introductory Cheeky Weekly episode indicates his Cheeky Annual outings had been well received. 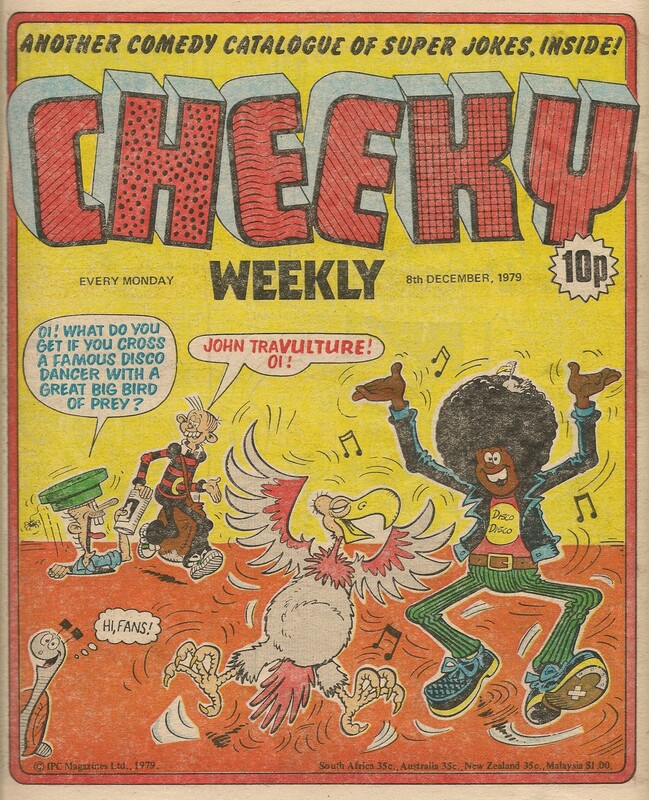 Soggy’s three previous Cheeky Weekly appearances were all on page 11. 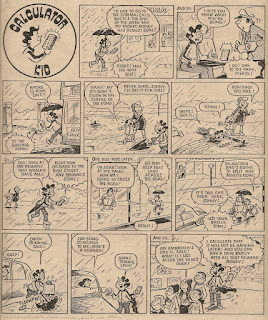 Actually, this issue was the closest the silly sea serpent got to the front of the comic – he subsequently returned to page 11, flirted briefly with pages 8 and 12 and finished up on page 17. 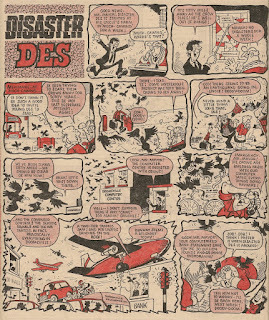 There’s mayoral merriment in Doomsville as Disaster Des leaves town. But all too soon there's very little to crow about. Following Des, on pages 13 and 14, is the front-cover-mentioned Comedy Catalogue, this week featuring the wild west witticisms of Six-Gun Sam. On Friday Goalie Cat returns to once again test Cheeky’s skill with a tin can. 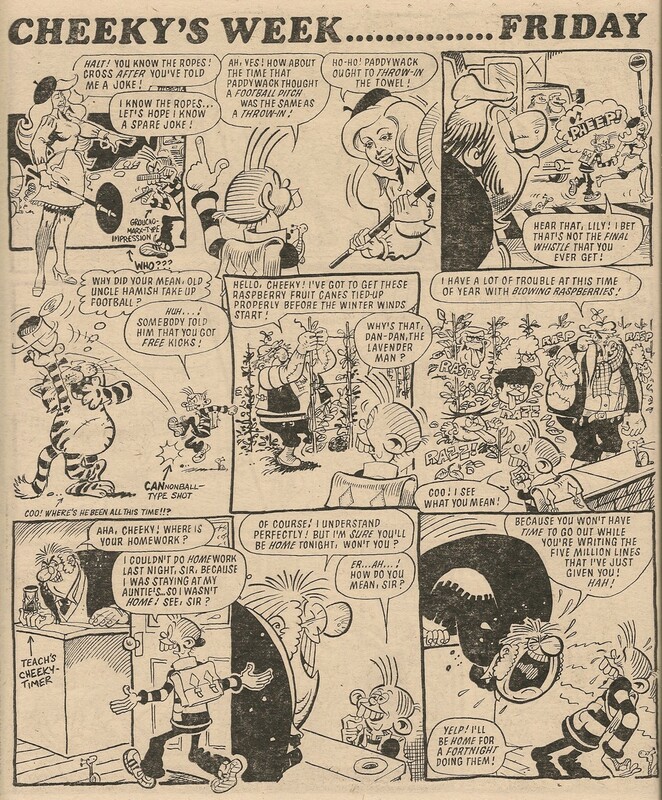 The feline footballer was last seen in the 25 August 1979 edition. On this page we also witness Yikky-Boo ‘razzing’ rather than uttering his customary exclamation. 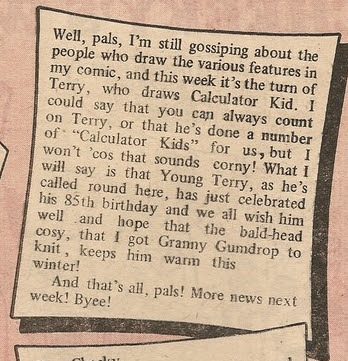 On the Chit-Chat page our toothy pal is indeed very cheeky about Terry Bave’s age. Cheeky's Saturday is devoted to supervising a toddlers' outing to the park playground. It doesn't end well as Baby Burpo is among the youngsters in the care of the toothy funster and pals. Snail of the Century again rounds off this issue, which features an all-Frank-McDiarmid Cheeky's Week.